Fact: I am not a vegetarian (although I do love vegetables!). 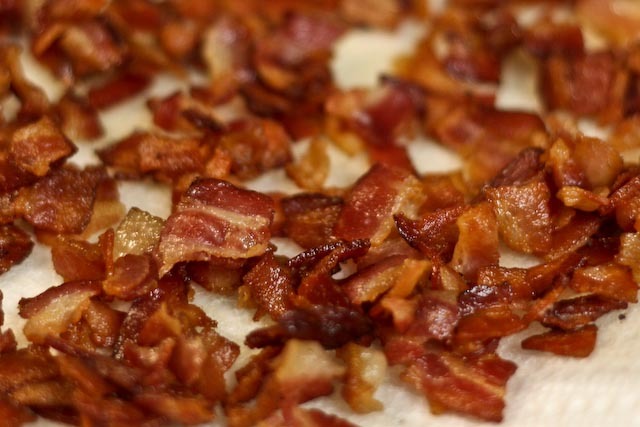 Fact: bacon makes just about everything better. Fact: these are cookies (cookies!) with bacon in them – yes, you heard me – BACON! I saw this recipe in Bon Appetit and was so intrigued – and salivating – that I just had to try them. 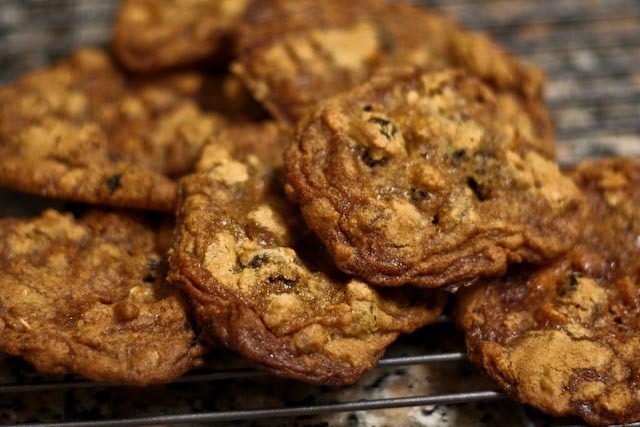 These puppies are a perfect combo of sweet and salty, and I think they make an excellent breakfast cookie – and they are terrific with a cup of cafe con leche! Just look at that bacon sizzle. I bet you’re salivating now, too. Yep. 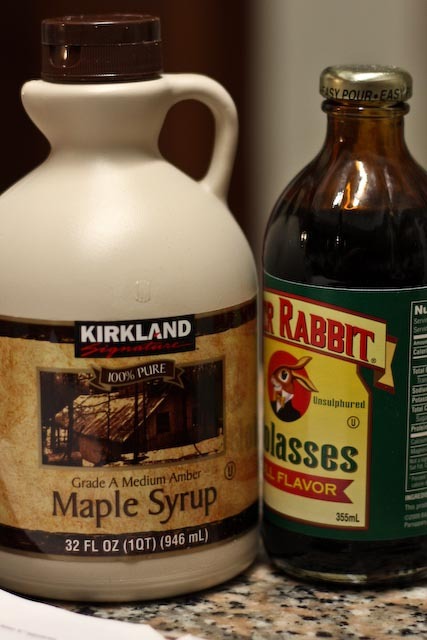 Butter, sugar, syrup, molasses and eggs. Yum. BAM! Bacon in the cookie dough! Disclaimer: this cookie dough is addictive. You WILL eat at least two cookies worth. Just let it happen. The cooking time in the recipe I used was slightly longer than I would have liked. I’ve shortened it here and also turned down the oven temperature a bit (we don’t want burnt cookies!). I took these into work and they were a huge hit and were devoured in about an hour. These are a salty sweet slightly bacon-y treat that would be a great addition to any weekend brunch buffet. 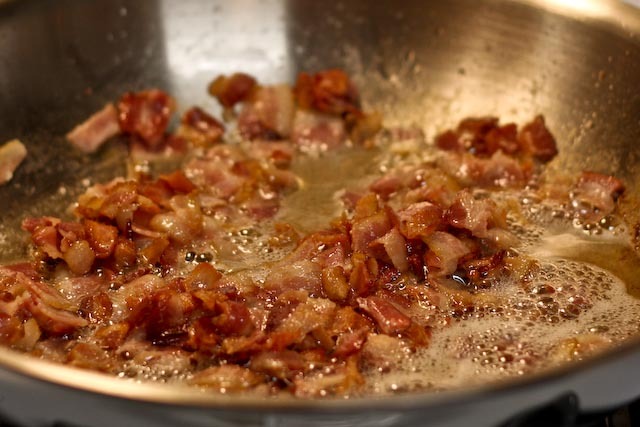 Cook bacon in a large skillet over medium heat, stirring occasionally, until browned and crisp. 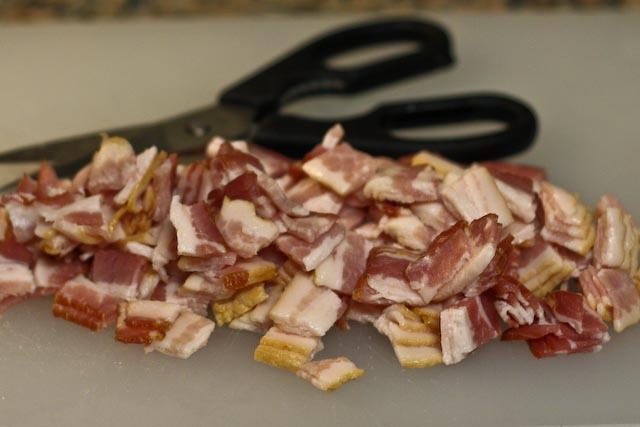 Transfer bacon to a plate lined with paper towel using a slotted spoon. 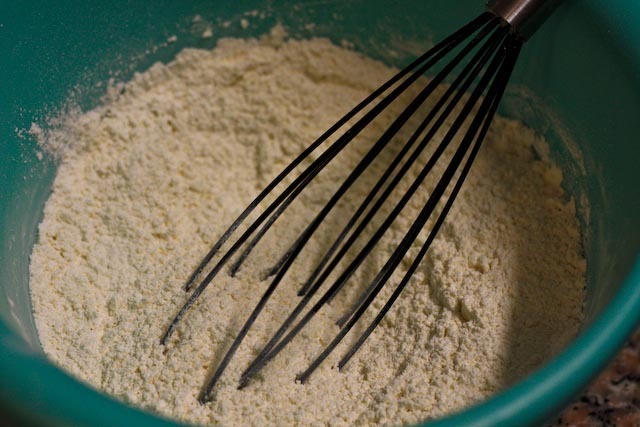 In a bowl, whisk together flour, baking powder, baking soda, and salt. 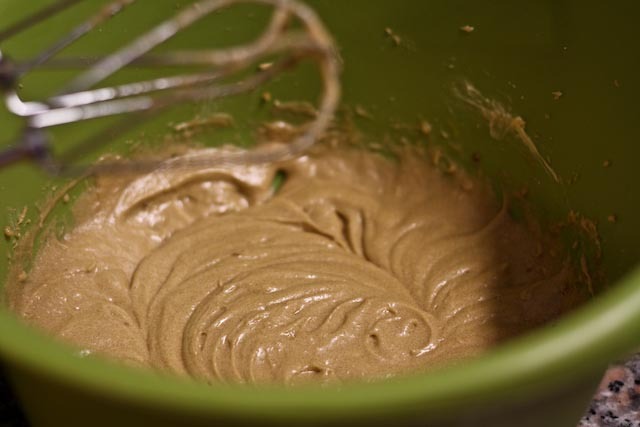 In a large bowl and using an electric mixer, beat together the butter, both sugars, the molasses and maple syrup until well blended (about 2 minutes). Add the eggs one at a time and mix well after each addition. Add the vanilla and mix well on medium speed for 4-5 minutes until pale in color and fluffy. Add the dry ingredients and mix until combined. 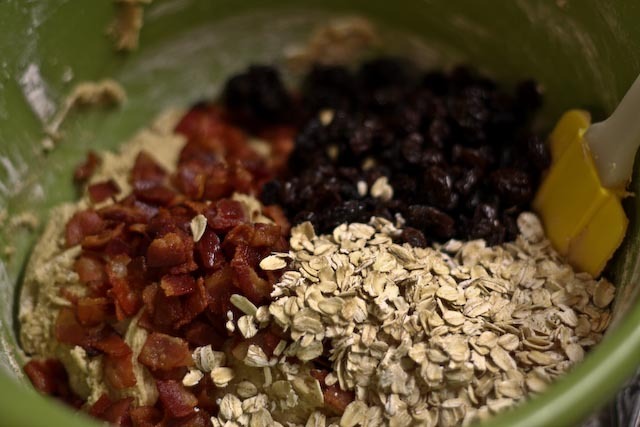 Fold in the bacon, oats and raisins. The dough will be sticky. 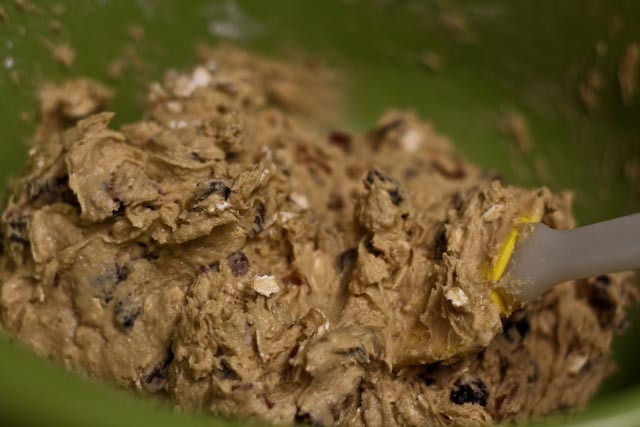 Using a tablespoon, drop spoonfuls of the dough onto large baking sheets lined with parchment paper, being sure to space them out at least three inches apart. Chill the dough on the cookie sheets for at least an hour. Arrange racks on the upper half of the oven and preheat it to 350°F. 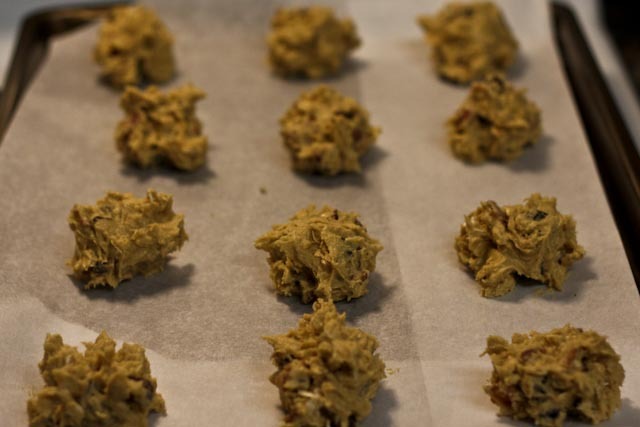 Bake cookies for approximately 18 minutes, rotating the baking sheets half way through, until the edges are golden brown and the center of the cookie is still soft. Let cool on the baking sheets for about 10 minutes and then transfer to a wire cooling rack to cool completely. Nutrition Information: These are definitely not low fat but they so are deliciously salty and sweet that they beg to be eaten (you don’t want to know the dirty details) – eat at your own risk! I heart bacon and these cookies are right up my alley. I must say you crisped your bacon up to perfection!